This VIP Combo Pearl Harbor tour includes visits to the USS Arizona Memorial, the USS Missouri, the USS Bowfin Submarine, and a short drive through Honolulu City tour. All of these exciting sites and structures in one amazing package. Being the leader in VIP luxury tours, we offer you the chance to visit Pearl Harbor in style and comfort. Avoid the hassle of traveling with a large group on a bus and reward yourself with the VIP small group tour you deserve. You will be picked up by our chauffeured style vehicle and taken to Pearl Harbor where you are offered a cold drink of water or juice before accompanied to the entrance of the Visitors Center. You will be met by our supervisor dressed in black with a gold tie to give you a brief orientation and provide your vouchers & tickets. Get ready to experience a memorable Hawaiian excursion. 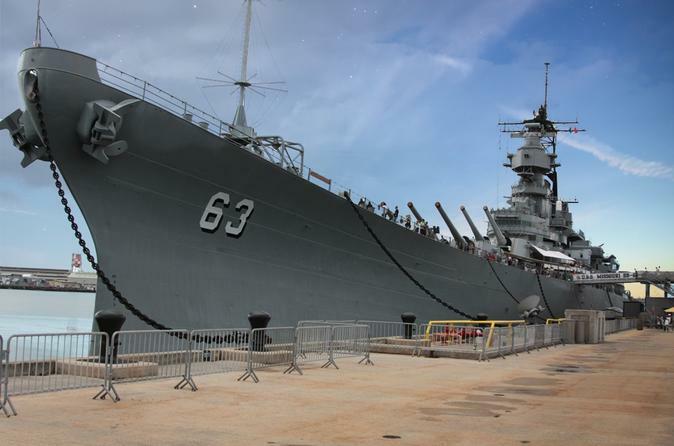 This VIP Combo Pearl Harbor tour includes visits to the USS Arizona Memorial, the USS Missouri, the USS Bowfin, and a short drive through Honolulu City tour. All of these exciting sites and structures in one amazing package. Being the leader in VIP luxury tours, we offer you the chance to visit Pearl Harbor in style and comfort. Avoid the hassle of traveling with a large group on a bus and reward yourself with the VIP small group tour you deserve. Rediscover the past with this executive level small group Pearl Harbor tour. Gain insight into the World War II Japanese attack and pay your respects to the service members who died on December 7, 1941. Explore museums & monuments and learn more about the history of the war.